Malaysia Healthcare’s Chief Executive Officer, Sherene Azli says, “This blood drive is part of Malaysia Healthcare’s Corporate Social Responsibility, under the “Share My Love” campaign, which carries the message that Malaysians are truly warm and friendly. This is a continuation from the “Malaysia Loves You” campaign, which was launched in 2016. “Share My Love” aims to highlight Malaysia’s most unique qualities as a healthcare travel destination of choice”. This blood drive underlines the role every single person can play in helping others in emergency situations, by giving the valuable gift of blood. It also focuses on the fact that it is important to give blood regularly so that the blood stock is sufficient before an emergency arises. PDN meanwhile launched its own campaign with the tagline “One Blood Donation Can Save Three Lives”, to encourage blood donation. The short shelf life of some of the components is the reason why there is a constant need of supply in the blood bank. The short shelf life of some of the components is the reason why there is a constant need of supply in the blood bank. Red blood cells can last a maximum of 42 days; platelets can last for five to seven days while plasma that is frozen and kept in the right condition can be kept for years. “As Malaysians are known for their generosity, we are confident that the target of increasing the nation’s blood supply will be fulfilled. A single donation by just one person, can save three lives”, added Sherene. Sherene further commented that, “We are proud over Malaysia’s hat trick win at the recent the International Medical Travel Journal (IMTJ) Awards 2017 in Opatija where we were honoured once again as the recipient of “Destination of the Year”. 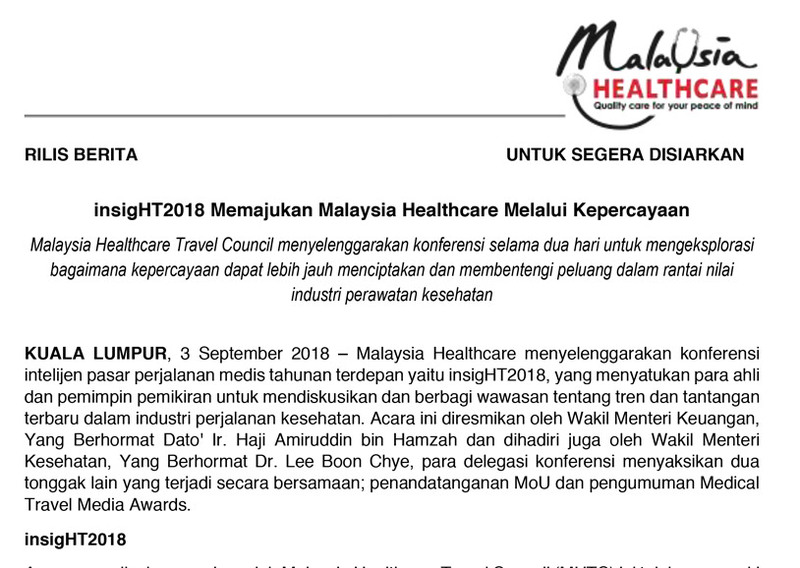 The Malaysia Healthcare Travel Council (MHTC), also received for the first time, a win as the “Health and Medical Tourism Cluster of the Year” award. The award recognises efforts by a health or medical tourism cluster or association that demonstrates unparalleled qualities in organising, managing and stewarding medical or health tourism organisations and enterprises under its umbrella. Per Sherene, “Malaysia Healthcare is striving harder to strengthen the travel value-chain as a holistic proposition, through three key tenets of industry facilitation, optimisation of digital marketing and sustainable growth. Our aim is to continuously reach out to all to help make a difference to the sustainability of our world class quality health care offerings, which includes ensuring there is sufficient blood supplies at the country for the people in need. Hence, our participation in this Blood Donation Drive at the country level as part of our CSR works”. #sharemylove aims to highlight Malaysia’s most unique qualities as a healthcare travel destination of choice. More details can be obtained at www.mylovesyou.com.